We have recently successfully undertaken a small-scale ‘pioneer’ community share issue to contribute £50,000 to the funding package for our development in Walsden of six independent-living bungalows. Building homes for the future – together! Calder Valley Community Land Trust believes that community-led efforts can help achieve the new homes we really need in our Valley. 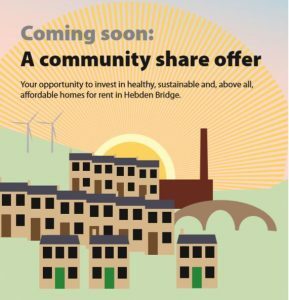 We had been well advanced in our plans to raise capital from within our community for our proposed development of 20 homes in High St, Hebden Bridge, with over £150,000 already ‘pledged’. With the decision of the council’s planning committee in February 2019 to decline planing permission, however, we are now temporarily deferring progressing the community share launch. Nevertheless we will still be pleased to hear from you if you consider it likely that you will, in due course, be prepared to invest in the CLT. More details are in our pledge leaflet. We have been working with the aim of raising £500,000 through our Community Share Issue. This will be an investment primarily for social rather than financial benefit. However, we anticipate paying interest, likely to be 2%-3% a year. When we launch, investments will be able to be made for a minimum of £250; the maximum for any individual will be capped at £40,000. 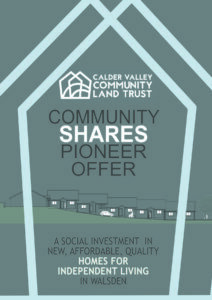 Holders of shares will be members of the Calder Valley Community Land Trust and will have voting rights in the society (each member has a single vote). In due course, we will be preparing a detailed offer document and business plan, so that all investors will know about the social and financial sides of the development, and why we believe it will be a secure place to put your money. There is a lot of information on how social investment is working to drive real improvements for communities across the UK at the Communityshares.org. You can find out more about what community shares are, here. You can register your potential interest in the share issue now. This is without obligation, but means that you will receive details of the launch event and will receive the share offer document when it is available. You can register your interest by emailing us on info@caldervalleyclt.org.uk. Let us have your name, address and email address and we will do the rest. If you think you are likely to be able to invest next year, it will help our planning if you can advise us now. This is entirely without legal obligation, and you will be able to decide whether to invest, and if so how much, when the offer document is launched. You can paste the form below into your email, ticking the amount you expect to invest.